Caiden had his first dental visit today. I know I am a bit late, but life has gotten in the way. Finally, I had a chance to find a pediatric dentist and a good one at that. My neighbor (Mackenzie's parents) referred me, and I called and made an appointment. 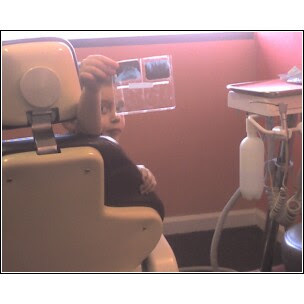 Caiden was originally a little unsure about going, after all Dave has an aversion to the dentist and refuses to go. I told Caiden how much fun it would be and how they had toys and stuff in the waiting area. When we woke up this morning he seemed game, so I was excited about that. He did SO well! They took him back to get his xrays done and he asked a LOAD of questions. They were very patient and explained everything. The same thing happened when they went to clean his teeth. I explained everything as did the dental assistant. He was doing really well until the little boy next to him started crying and then he got worried. He asked me why the boy was crying and I told him that the boy was scared because the toothbrush the dentist used was different than the one that he used at home and that made the boy scared. Thankfully, the dentist worked off that explanation with Caiden and things went smoothly from there. The dentist said that their toothbrushes have batteries and that it's different than some kids at home. I told the dental assistant that Caiden's toothbrush has batteries too, and Caiden was proud to announce that since his toothbrush had batteries too he wasn't going to be scared. Caiden was excited that they brushed his teeth with chocolate flavored toothpaste. Sounds nasty if you ask me, but he was impressed. He also liked the taste of the fluoride which apparently tasted like strawberries. It was all over and done very quickly (once we got in to be seen). The dentist declared that Caiden had no cavities and told me to keep doing what I have been doing. Thankfully, his teeth have not been damaged due to him sucking his middle two fingers, although Dave and I are working really hard on breaking him of this habit. They really made a big deal out of Caiden having no cavities. They gave him an orange balloon, stickers, entered his name in a drawing, gave him a coupon for a free Chick-fil-a kid's meal that declared that he had no cavities, gave him a pencil, and an award that can be redeemed at Chuckee Cheese for 10 tokens. I wanted to reinforce his award so we left the dentist and immediately went to Chick-fil-a where HE wanted to hand the lady his coupon. She read it and made a big deal about him having no cavities. 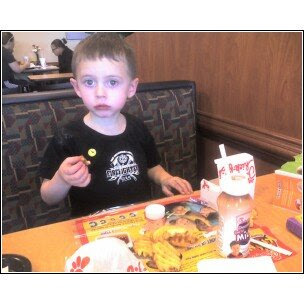 As we were sitting there eating he told me he wanted to go home and brush his teeth, which is pretty much what he did. He must have brushed his teeth 3 more times after we got home. All and all he was really excited to go to the dentist, and the dentist and the assistants stated that he was a pleasure to have there. Reward for a job well done!! I apologize about the poor quality of the pictures, but I didn't exactly want to bust out the camera in the dental office, so I had to sneak pictures with my phone. Also, Caiden was not exactly in the mood to take pictures since we had the Easter disaster experience yesterday. Congrats Caiden!! Excellent work!! You are far better than me at the whole no cavity thing!! Hehehe. Tell him to keep up the good work so his teeth don't fall out...hehehehe.